Today's offering comes from Breadbar in the Century City Mall in LA. Fellow Busters and I settled on Breadbar since it was the only place that we hadn't been to yet and that we didn't already hate. Seasoning--Flakes of sea salt on the burger--too much--the grit was not appropriate. Now, in spite of all this, the burger was probably the best burger in the area. The meat was juicy and flavorful--not enough to overcome the saltiness--it tasted of Angus and blood with a little pepper. The meat:bun ratio was right where it needed to be. The bun looked daunting and dry, but it compressed and yielded properly. The cheese, in spite of not being melted, provided a nice complement in terms of flavor and texture. The patty was probably pre-formed based on the rubbery edges, but the quality of the beef rose above the abusive handling and preparation. 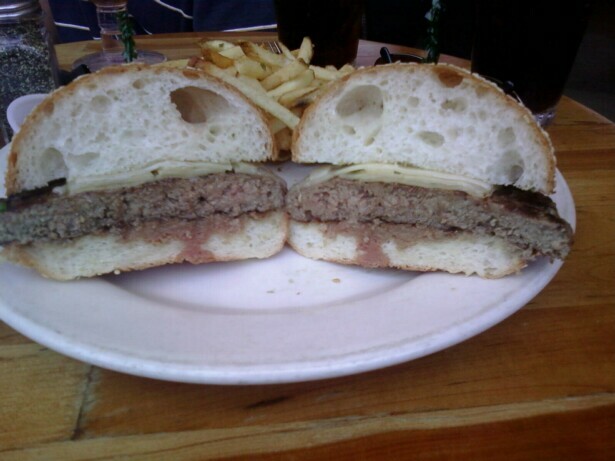 Burger Review -- A completely flawed burger in terms of preparation, which almost succeeded in spite of the incompetence of the kitchen staff.